"Closer" is a song written by Trent Reznor and featured on the 1994 Nine Inch Nails album The Downward Spiral. In mid-1994, the song was released as the second single from the album. Most versions of the single are titled "Closer to God", a rare example in music of a single's title differing from the title of its A-side. ("Closer to God" is also the title of an alternate version of "Closer" featured on the single.) 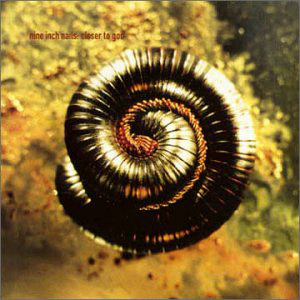 Labeled "Halo 9", the single is the ninth official NIN release. Several broadcasting stations felt the song was not appropriate to air when uncensored. A promotional single provided by the label to radio stations included both long and short vocal-censored-i.e. : silenced profanity-versions. In spite of the blunt and profane sexual content contained in the song's lyrics, "Closer" became Nine Inch Nails' biggest hit up to that time, cemented Reznor's status as an industrial rock superstar, and remains arguably his best-known song. Heavily edited versions of the song and its equally explicit and provocative Mark Romanek-directed music video received substantial airplay on radio and MTV. The Downward Spiral is the second studio album by American industrial rock act Nine Inch Nails, released March 8, 1994, on Interscope Records. It is a concept album detailing the destruction of a man, from the beginning of his "downward spiral" to his climactic attempt at suicide. The Downward Spiral features elements of industrial rock, techno, and heavy metal, in contrast to the dance-influenced Pretty Hate Machine (1989). Nine Inch Nails (abbreviated as NIN, sometimes stylized as NIИ) is an American industrial rock project, founded in 1988 by Trent Reznor in Cleveland, Ohio. As its main producer, singer, songwriter, and instrumentalist, Reznor is the only official member of Nine Inch Nails and remains solely responsible for its direction. Nine Inch Nails' music straddles a wide range of genres. After recording a new album, Reznor (until the 2009 Wave Goodbye Tour) usually assembles a live band to perform with him. The touring band features a revolving lineup that often rearranges songs to fit a live setting. On stage, Nine Inch Nails often employs visual elements to accompany performances, which frequently include light shows.